Afterwards, each intern briefly introduced themselves to the community and shared their personal experiences as an APA and their reasons for joining the Leadership Academy. Katrina will be interning at the Office of California State Assemblymember Chris Holden. Sylvia Guan, an English major and M.S. candidate in Social Policy and a rising senior at the University of Pennsylvania, expressed, “To me, embracing my Asian American identity means embracing a political one, and as we see more injustices occurring in the media today, I ask myself, and my community, what are we doing to combat them?” She believes that the CAUSE Leadership Academy will give her the experiences and resources to better advocate for marginalized communities. Sylvia will be interning at the Office of California State Senator Josh Newman. Sabrina Inoue, a Philosophy, Politics, and Economics major and a rising junior at the University of Michigan, shared how she became interested in the Leadership Academy. She explained, “Moving from LA to Michigan, I realized that for the first time, I was one of the only APA people in my classes and I started to question my identity as an APA and how I’m representing my community in these settings.” She hopes that through her summer with CAUSE, she’ll become more informed about APA issues and learn how to better empower herself and the community. Sabrina will be interning at the Office of California State Assemblymember Al Muratsuchi. Mint will be interning at the Office of Los Angeles City Mayor Eric Garcetti. Diana will be interning at the Office of California State Assemblymember Ed Chau. Hanah will be interning at the Office of California State Senator Ed Hernandez. Dim will be interning at the Office of California State Controller Betty Yee. Erika will be interning at the Office of California State Treasurer John Chiang. Sonia Romero, a Business Administration major within the World Bachelor in Business Program and a rising sophomore at the University of Southern California, introduced herself by briefly sharing her experience as an Asian Pacific American who grew up in Hawaii. When asked during her Leadership Academy interview what she felt the difference was between being an Asian American in Hawaii and being an Asian American as a part of a majority on the mainland, she responded, “I was completely lost and had no idea on how to answer it, and that made me realize that I had really taken for granted a lot of the privileges that came along with being an Asian American within a majority.” Through this internship, she hopes to gain a better understanding of the wide range of barriers faced by the APA community. Sonia will be interning at the Office of US Congressmember Adam Schiff. 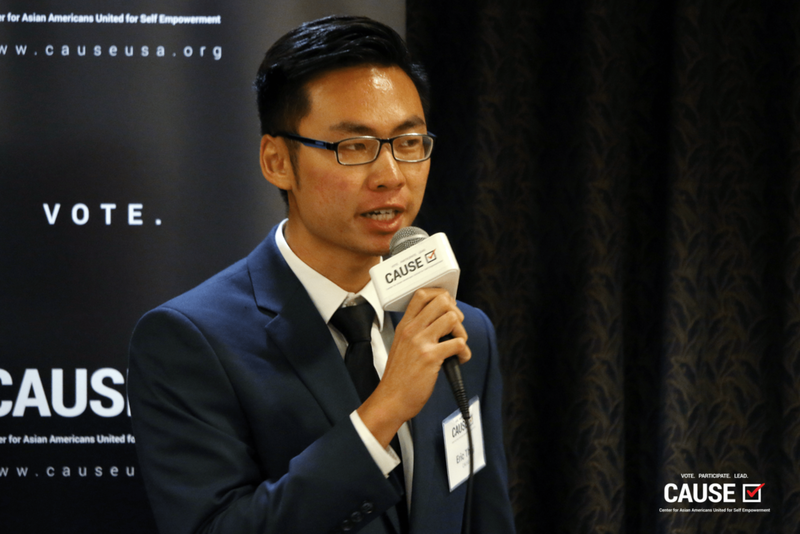 Stephanie Sun, a Political Science major and a rising sophomore at the University of California, Berkeley, referred to community leaders as her inspiration for wanting to give back to the community. She recalled, “I had leaders in my community who I looked up to and I saw [them] take charge and try to inspire the youth.” She hopes her internship will provide her the necessary growth to become a community leader like those she admired. Stephanie will be interning at the Office of US Congressmember Mimi Walters. Eric will be interning at the Office of California State Assembly Speaker Anthony Rendon. Allison Vo, a double major in Ethnic Studies and Sociology with a concentration in Social Inequality and a rising senior at the University of California, San Diego, relayed her personal story about immigrating to the United States from a refugee camp in Malaysia. 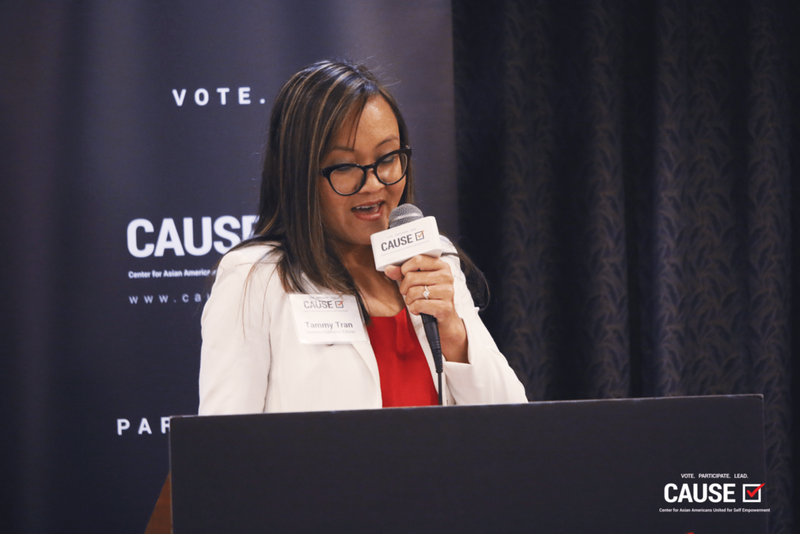 She stated, “Today, I am grateful to be here with my cohort to see you all, and to work for the office of Congressmember Lou Correa so that we can work collectively to solve the issues in our community.” In the future, she hopes to “bridge the gap between our ethnically diverse communities and to pursue a J.D. in immigration law” in order to better support immigrant families just as how she felt supported by the other families that helped her own. Allison will be interning at the Office of US Congressmember Lou Correa. Helen Yu, a double major in International Comparative Studies (with a focus on East Asia) and in Asian and Middle Eastern Studies and a rising senior at Duke University, brought up the personal struggles she faced with her Asian Pacific American identity. She shared, “For most of my life, I’ve heard people tell me what I can and cannot do because of my race. For the longest time, hearing these things made me loathe my DNA. And I would wonder, ‘Why am I Asian.’” These past thoughts encouraged Helen to search fervently for Asian Pacific American role models and she now hopes to take an active role in shaping the future of the Asian Pacific American community. Helen will be interning at the Office of California State Senator Ben Allen. Olivia Zheng, an English major and a rising sophomore at Amherst College, talked about the culture shock she experienced when she, having grown up in an Asian Pacific American community, moved to the East Coast. She recalled, “This past year, I’ve learned so much about the diverse and different experiences of Asian Americans: how hard it is to community organize and the importance of coalition building.” Through the Leadership Academy, Olivia hopes to “gain access to the resources, to the knowledge, and to the connections” that will help her become a better leader for her community. Olivia will be interning at the Office of Los Angeles City Councilmember David Ryu. We’d like to thank our sponsors for supporting the 2017 class of Leadership Academy interns.